Women - Can You Ever Have it All? Almost tired of reading and hearing about articles on gender gap, equality, diversity hiring initiatives ... and believe me - today, this has almost become a sole full time occupation/ role for many within organizations. Just think for a moment - What do we mean here? What are we trying to achieve? Why are we inducing a target metrics and force feeding female candidates <mostly fresh college interns as they are relatively easier to hire in volumes> to attain our ‘diversity targets and once met, we emerge as a lead diversity champ? Ah, now all those supporting gender analytics, florescent pie charts and that deadly graphs with almost invisible dots depicting women at top ranked positions - seems so much in circulation and I know are almost at the verge of losing its relevancy. Well, I agree that we all agree the need to ‘fill in the gap’ - but friends, be aware this is not a quick fix solution that your recruitment team can provide. We need to think bigger & bolder not only on the ‘WHAT’ but the ‘WHY’ aspect of this issue, if you may like to call it one. I encourage you to look within your own homes, offices, neighborhood - understand the how we are culturally brought up. During our growing up years most houses see default roles of mom being available 24X7 dedicated to family. In case you are middle-aged or beyond, how many of you have/had working moms Vs working dads. How many of you had both your parents working and were you were sent to creches? How many of you would have seen your mommies sacrificing their careers when it comes to making a choice between work and family? 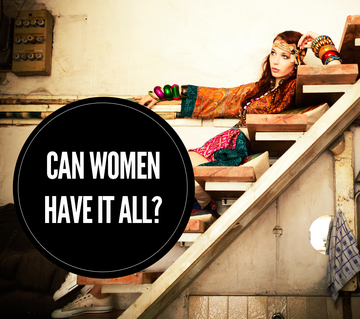 Do you believe that both partners with fierce ambitions - cannot survive and make it work? Well, if they cannot - why are we trying all the above to start with ...where in the end its always women, by default - to let it go. Think! Come folks, we have to grow up and break this rusted mold. In almost 20 years of my career, I am amazed to see that most of my successful male peers and their bosses <who are most passionate about getting more females in corporate and are running endless initiatives to reach that ‘target’> had their wives as home-makers. Some of these by circumstantial choice and rest succumbed to their husbands super ambitions. I salute such women - as letting it go and live someone’s dream is no easy job! But what about handful of those brave women in corporate who managed the struggle and passed through the much famous ‘work-life balance test. Are they happy today not just by their mere existence in that sphere - but do they command their truly deserving space...at work, at home and most important in their own eyes. Do they have space to grow and have next role genuinely identified by their progressive managers. Are they free from the fear of getting marginalized and their managers understand the struggle and helping keep them mainstream. Answer to all these in my ideal world should be a firm Yes. My humble observation says, bosses with working spouse are far more sensitized to all that I listed here and are by far more supported than many mechanized insure power laden competitors at work. Now take a moment to think about it. Where do you genuinely stand. So, this is to all aspiring energetic and passionate women - who in their mind, clearly defined what success means to them - both at personal and professional front. Women who knows specific steps to reach their maximum potential and eventually benefit others. Do remember, success is a journey and not a destination. The key here is to link your desire with a clear purpose ...without which the journey can be a lonely and shallow experience. So let’s go and from now on TOGETHER ! Seasoned leader driving Business Strategy, planning & operations towards a positive impact. Love to interact and observe diverse human behavior and am a constant learner. Women In The Armed Forces: Do You Have It In You?